I’m responsible for all areas related to market expansion and development within OCG Creative. This includes spotlighting emerging Internet technologies, integrating them into our client’s marketing mix as well as our own, and developing internals like project life-cycle, SFA, CRM, website lead generation and pipeline management. I was instrumental in transforming OCG Creative from a traditional advertising and creative agency into a leading digital agency and technology firm. In recent years, I’ve focused my energy on developing a repeatable, scalable system for reliably achieving digital marketing goals, regardless of the industry. The result is the Internet marketing process we rely on today. We’ve genuinely transformed what it means to be a creative agency. Digital marketing is especially challenging because it covers so many things–SEO, local SEO services, web design, user interface/user experience design, CRM, marketing automation, paid search, social media, inbound marketing, email marketing… The list goes on… Most marketing agencies focus on one or two, making it difficult to develop integrated campaigns. Our process includes everything. It’s effective and makes it easy for business owners to control their marketing budgets. My favorite client is as excited about their business as we are of ours. This is someone who sees us all as part of the same team, with whom we meet and strategize, then execute what others say can’t be done. Afterward, we pop the corks and celebrate the victories together because we all deserve it! The agency of the future uses technology, imagery and language to transcend the boundaries of traditional media and develop genuine human relationships. The agency of the future is unstoppable because it is anchored in trust and delivers real, measurable outcomes predictably and reliably. I took a test once that said I don’t favor left over right brain thinking. I don’t know if that’s true, but I am equally comfortable in creative and technical roles. I’m a programmer and analytical marketing strategist, but I also do a lot of photography, videography, commercial production, copywriting and graphics work in general. SEO is a major focus for me. I’ve been developing effective SEO strategies since before “SEO” was a term, and there was no Google. I also teach email marketing in the University of Nevada, Reno’s social media program. Outside OCG Creative, I enjoy outdoor pursuits like kayaking and hiking with my family. 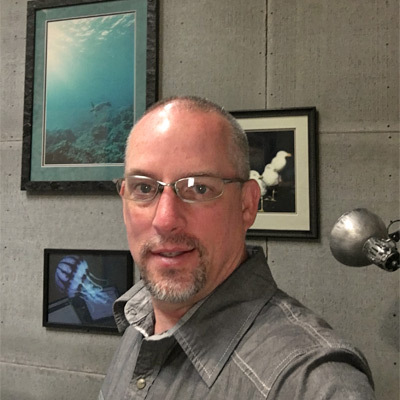 I’m an avid scuba diver and technical diving instructor, with almost 4,000 logged dives and 17 professional level certifications. I play a mean guitar too, but that was really another life.